Facet joint pain, also known as facet joint syndrome or facet joint disease is a syndrome where the facet joints cause back pain. It occurs predominantly in the cervical vertebra (55% of cases) and the lumbar vertebrae (31% of cases). Your facet joints are the small, synovial (movable) joints on each side of the spine, in between the vertebrae. Their purpose is to guide and limit the movement of each spinal segment. You have facet joints throughout your spine, in the cervical (neck), thoracic (mid-back) and lumbar (lower back) vertebrae. When functioning correctly, facet joints move freely controlling the movement of the spine. Irritation or locking of these tiny facet joints is the most common cause of back pain. Our facet joints can become painful when they are disturbed through injury, which causes the joint to stiffen, making it ‘hypomobile’, or through joint laxity, where the joint becomes too loose or ‘hypermobile’. The pain arises directly from the facet joint either from inflammation or from muscle spasms in adjacent muscles. This is the body’s way of protecting the area and trying to prevent you from moving and incurring more damage. What causes hypomobility of facet joints? joint capsule scarring and thickening (after trauma). What causes hypermobility of facet joints? a disease that destroys the joints, such as rheumatoid arthritis. What causes a facet joint to lock? Typically speaking, unexpected change of movement that happened too quickly for our muscles to respond appropriately, or exceeded the muscles’ capabilities will cause the facet joint to lock. Regular exercise to strengthen weak areas is important for those suffering from locked facet joints. A patient with a locked facet joint will present with pain that may refer to nearby areas such as the arm or shoulder (in a locked cervical facet joint); or buttocks or thigh (in a locked lumbar facet joint). The muscles surrounding the area will often spasm. Often, a patient may not be able to move away from the direction where the joint is locked. For example, if a joint is locked in a flexed forward position, the patient will not be able to arch backwards. Assessment by a physiotherapist is the best way to diagnose a locked facet joint. Using a facet joint release technique, a physiotherapist can release the joint fairly easily. In acute cases, the patient may be advised to rest and treat the area with either cold or hot packs. Once the acute stage has passed, massage therapy is particularly beneficial in calming and releasing the surrounding muscles and preventing muscle spasms. 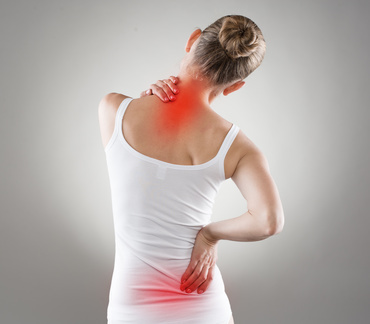 Massage is an excellent tool for relieving pain caused by facet joint problems. It can greatly release muscle tension as well as stimulating blood flow to the area. 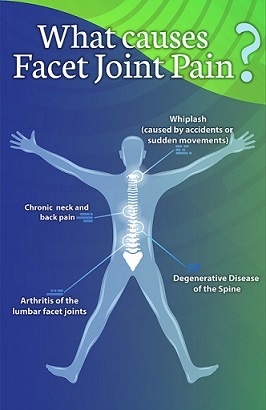 In particular, those who suffer from painful muscle spasms from facet joint problems can reap great rewards. The massage therapist needs to have a full understanding of a client’s pathology before they begin treatment. If a client suffers from severe facet joint pain, it’s recommended that they seek advice from a doctor before commencing a massage treatment program. If severe degenerative arthritis causes facet joint pain, it’s important that the massage therapist does not apply excessive pressure to these painful, arthritic areas. However, targeting the pressure points of deeper muscles can do wonders to release tension in the affected area. If your client often suffers from facet joint pain, it’s important to address the weaknesses in the area to avoid the muscles being overwhelmed and going into spasm. By developing stronger muscles that can perform well in a range of movements, an individual will usually be able to decrease the incidence of facet pain or locking. The exercise prescription will depend entirely on the individual’s pathology, and comprehensive examination by a massage or physical therapist. For more information about the benefits of exercise for your massage clients, see our blog post: Mobility exercises: Huge exercise benefits for your clients between sessions.